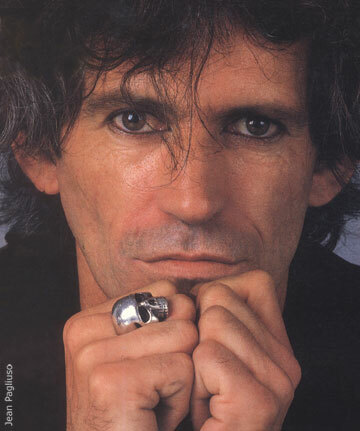 Over the years Keith Richards silver skull ring has taken on its own mythology and iconic status. The most famous ring in the world has come to signify not only Keith Richards the man - seen wearing it at every gig and in every photograph – but Rock and Roll itself. The ring has inspired both an international cult following and unlimited fake copies. There have been countless claims as to who designed and made the original but this is the true story. In 1978 the celebrated London goldsmiths David Courts and Bill Hackett were working on a small scale silver sculpture of a human skeleton. Using a real skull for reference they carved a perfect miniature replica which they then moulded. When the hollow wax skull was removed from its mould the inspiration for the ring was born. Further experimentation led to the creation of the original silver skull ring. At the same time an invitation arrived from Keith Richards to his birthday party in New York - so Bill and David decided that the new ring would make a fantastic present. From the moment he put it on his finger, the magic began and he has worn it ever since.